My last post was about the use of three basic systems concepts (inter-relationships, boundaries, perspectives) in evaluation design. The post before that was about C. West Churchman’s last great book ‘The systems approach and its enemies’ (1979). In this post I will combine the two in ways that are both subtle and broad. What I have been after the last few years is no less than the holy grail of systems thinking. Maybe this is it, but let’s not get our hopes too high. Besides there is always the temptation of a quest without an ending. Which resembles the human quest to improve his condition by ever redesigning his social systems. The systems approach … is the title of Churchman’s first book in his ‘systems approach’ trilogy (1968, 1971, 1979). The last book of the trilogy was called The Systems Approach and its Enemies. There was obviously a certain development in the cycle, which suggests that the last book holds the (final) key to the other two. I summarized the last book in the previous post (Churchman wrote one more book, Thought and Wisdom – 1982 – but that’s not part of the trilogy). As usual I made a concept map. I lifted the key part out of that concept map and put it in a red-bordered box. 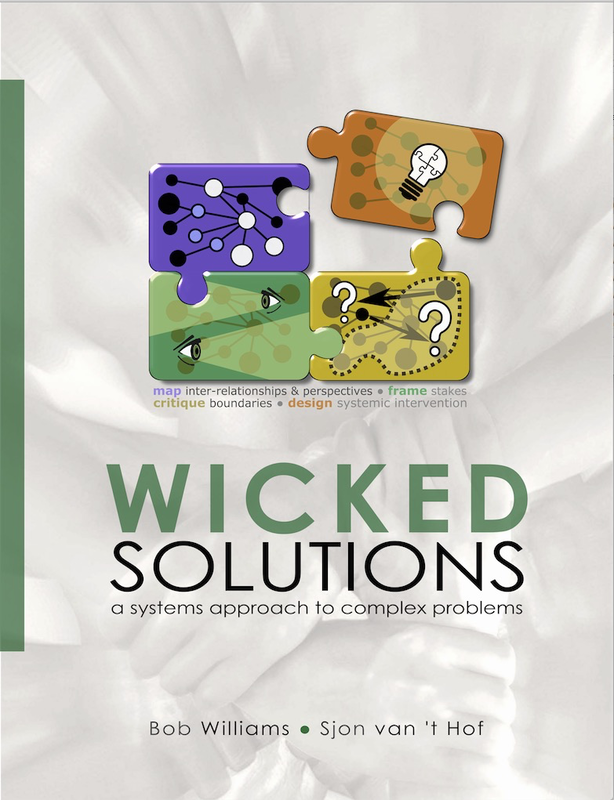 Wicked solutions … is the title of a book of which Bob Williams is the main author. Bob Williams has used three basic systems concepts (inter-relationships, boundaries, perspectives) in his published work and workshops in various ways. I put them in the green-bordered ‘wicked solutions’ box to the left. The next step was just a matter of linking the two boxes. The red arrows are about the origin of the wicked problem. I put “wicked” between quote marks, because it is quite normal that problems are not solved if one takes too narrow an approach to them (= environmental fallacy). It also makes a lot of sense to expand the boundaries of the system in which the wicked problem occurs so that one can properly see which inter-relationships (i.e. structures, patterns, processes, and dynamics) can be linked to the occurrence or emergence of the problem. If that is all, the systems approach is not all that interesting. Dialectical heuristic What makes the systems approach powerful and worthwhile is a tool in it, which I call the ‘dialectical heuristic’. 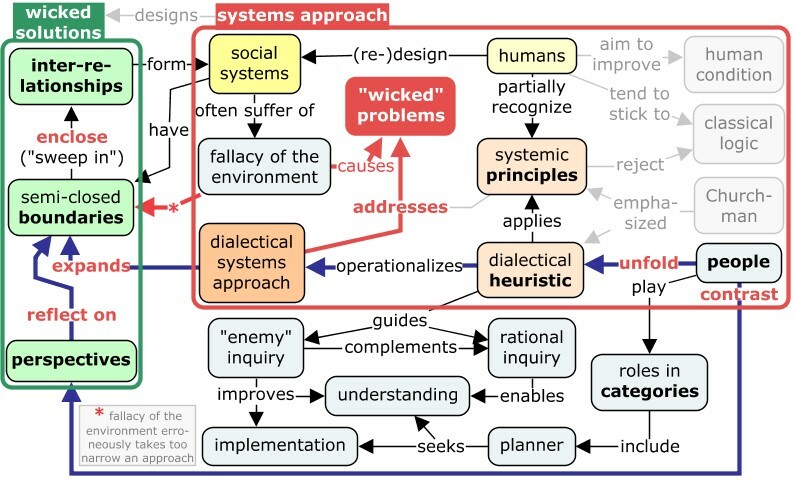 This heuristic is a set of conceptual relations for the design and operation of all social or human systems, including manufactured items (an example of this can be gleaned from Conklin 2001 although he rather uses wicked problems concepts than dialectical heuristic concepts). Churchman developed this heuristic from his seminal work in operations research in the 1950s and his logico-philosophical studies in the 1930s. The starting point is that all human systems are teleological, ie. they serve the purpose of improving the human condition, which is necessarily all about value and meaning. If it is properly used, the dialectical heuristic applies certain systemic principles that Churchman discovered/developed/designed. Most people apply at least some of these principles quite naturally some of the time, but they do not do so consciously and consistently. The heuristic is used to for a comprehensive systemic inquiry of the problem situation. Categorical roles The proper use of the heuristic takes a conscious effort by the main stakeholders or most relevant actors involved. The main roles are those of the client (or beneficiary, but also in a negative sense as victim), the decision-maker, and the planner. Actors can play multiple roles, e.g. if a decision-maker may benefit in some way from the situation (e.g. by getting a good salary) he or she also plays the role of a client. I have explained at least some of this elsewhere, e.g. here or here. Deception-perception Of special importance are the principles of deception-perception. The trouble with human perception is that it can never be entirely objective, even if we try very, very hard and open-mindedly. Every way of perceiving obscures necessarily certain aspects of reality. Which is the reason why dialectics are necessary. Only by contrasting different perspectives can we get the fullest possible picture and can we reflect on the system boundaries that brings us closer to a sufficiently satisfactory solution to the wicked problem (this, by the way, is called satisficing, a term of Herbert Simon and not of Churchman, who preferred to talk in terms of approximation, something he had learned from Edgar A. Singer, himself a student of William James). Enemies There is one final thing. In 1979 Churchman added 3 more categories to his dialectical heuristic. The key one is: enemies of the systems approach. Later he would say that he regretted having called them enemies, but that’s not very important. The thing is that the first 9 categories in were part of the rational part of the heuristic, the last 3 are the irrational ones, or less rational ones. They include politics, morality, religion, and aesthetics. Politics is easy to understand: politics cannot work if it is purely rational, it also needs majorities or sufficient support in one way or another for implementation (another category in the heuristic) of any plan to be secured. Morality is what Churchman called the humanistic systems approach in his earlier work (e.g. Churchman 1968). Morality, too, does not always easily fit in a teleological framework, something utilitarianists will readily admit. Sweeping in and unfolding It is often said that the systems approach is about ‘sweeping in’ and ‘unfolding’. Unfolding is what people do when they apply the dialectical heuristic. Sweeping in, that is including additional inter-relationships that had not been considered earlier, is what happens by expanding the boundaries. The boundaries can be anything, not only physical things, but also mental or psychological aspects, often having to do with the world views of stakeholders. Well, that’s it. More or less.